Background: A growing body of literature has been focusing on individual alexithymia in anorexia nervosa, while there are only scarce and conflicting studies on alexithymia in the families of anorexic patients, despite the important role played by family dynamics in the development of the anorexic disorder, especially in adolescent patients. The aim of this study is to assess alexithymia in anorexic adolescent patients and in their parents using a multimethod measurement to gain more direct, in-depth knowledge of the problem. Methods: Forty-six subjects, anorexic adolescent patients and their parents, underwent the Toronto Alexithymia Scale (TAS-20) along with the Toronto Structured Interview for Alexithymia (TSIA), which represents the first comprehensive clinically structured interview focused specifically on assessing alexithymia. The use of latent trait Rasch analysis allowed a comparison of the two instruments’ sensitivity and ability to detect the presence and intensity of alexithymic components in patients and parents. Results: Significant discordance was found between the two measures. The clinical instrument allowed detection of a greater level of alexithymia compared with the self-report, in particular in our adult parent sample. Moreover, a significant alexithymic gap emerged within families, particularly within parental couples, with noticeably more alexithymic fathers compared with the mothers. Conclusion: The TSIA clinical interview may be a more sensitive instrument in detecting alexithymia, minimizing parents’ negation tendency. Clinical questions have arisen on how useful it would be to give greater weight to family functioning (ie, alexithymic gap) in order to predict the possibility of establishing a therapeutic alliance, and thus the outcome of the anorexic adolescent. Difficulties in identifying feelings have proven to be an important prognostic factor in the evolution of anorexia.14 It must, however, be noted that research on the topic, conducted on adolescent samples,15–19 continues to be scarce, although this pathology typically arises in adolescence. This would trigger doubts on the validity and reliability of alexithymia self-administered measuring systems. Self-report instruments are inevitably influenced by the subject’s will and ability to refer to what he or she feels, thus by the very capacity an alexithymic is not supposed to have.26–28 A more reliable assessment of such a complex construct as alexithymia would generally entail multimethod measuring29,30 that combines a categorial (diagnostic) approach as well as a dimensional (trait intensity) approach, attained using both self-administered and interviewer-administered instruments. An interesting study by Berthoz et al31 conducted on Eating Disorders (ED) patients has paved the way in this direction, comparing various alexithymia measuring instruments, among which we can find the widespread TAS-20 self-report and another, lesser known, report (Observer Alexithymia Scale d’Haviland32). Considering the interesting results of the aforementioned study, the prime aim of this research was to use a multimethod measurement to assess alexithymia in anorexic adolescent patients and in their parents. For such a purpose two different instruments were chosen, a self-administered questionnaire and a structured clinical interview, TAS-2033,34 and the Toronto Structured Interview for Alexithymia (TSIA).35 Both instruments developed by the Toronto-based group are theoretically similar, thus enabling a comparison of their sensitivity and ability to detect the presence and intensity of alexithymic components in families of anorexic patients. The second aim of the study was to broaden the limited knowledge on alexithymia in adolescent anorexic patients and in their parents, considering them not only as isolated individuals but as members of an interconnected triad, a restricted family nucleus that has specific ways of expressing and managing feelings. We considered each triad as a restricted family nucleus in order to compare the alexithymia of the daughter, the mother, and the father and to determine the mean alexithymia score for each family nucleus. The sample included 46 subjects: 16 anorexic adolescent patients (aged 13–17 years) and their 30 parents. The subjects were consecutive attendees at the Child and Adolescent Neuropsychiatric University Unit of the San Gerardo Hospital, University of Milan-Bicocca, Monza, Italy, from March to June 2013. We considered each triad (daughter, mother, father) as a restricted family nucleus. Due to ethical problems, siblings, where present, were excluded from this study, avoiding their medicalization. Participation in the study required that all participants gave their written informed consent. The study was carried out according to the standards for good ethical practice of San Gerardo Hospital. Selection was based on the following inclusion criteria: restrictive Diagnostic and Statistical Manual of Mental Disorders, Fourth Edition, Text Revision (DSM IV-TR) diagnosis of anorexia nervosa, female, aged from 13 to 17 years, and parents’ consent to participate in the study. Exclusion criteria instead included another major diagnosis (autism, schizophrenia, mental retardation) and undergoing psychotherapy for an extended period (more than 3 months). The anorexic adolescent patients’ mean age was 15.81 years, ranging from 13 to17 years, and their mean current body mass index was 16 (standard deviation =2), resulting in being quite representative of the population usually attending the Child and Adolescent Neuropsychiatric University Unit and entering clinical research programs.12,13,19,36,37 Among the 32 parents, one of the fathers had passed away and one of the mothers could not be traced at the time of the research. The mothers’ mean age was 45.8 years, ranging from 36 to 52 years, and fathers’ mean age was 49.13 years, ranging from 38 to 61 years. The TAS-2033,34 is the most widely used self-report questionnaire to measure alexithymia. This instrument provides the total score and also measures three major components of alexithymia: difficulty identifying feelings (F1), difficulty describing feeling to others (F2), and externally oriented thinking (F3). The TSIA35 is an interview conceived to measure alexithymia. It comprises a total of 24 items subdivided into four subscales (each with six items) designed to evaluate four core dimensions of alexithymia: difficulty identifying feelings (DIF), difficulty describing feelings (DDF), externally oriented thinking (EOT), and imaginal processes (IMP). Each question is scored on a three-point Likert scale ranging from 0 to 2. Higher scores indicate a higher degree of alexithymia, and total scores range from 0 to 48. Its design stems from the need to compensate the weaknesses of the TAS-20 (Table 1): self-assessment and exclusion of a measure of poor imaginal processes. The presence of an external interviewer guarantees, contrarily to what happens with the self-report questionnaire, that the answer be investigated and clarified whenever the interviewee shows scarce consciousness of his/her problems. In the validation study of the Toronto group,35 as well as in the validation of the Italian version,41 the TSIA obtained a good interrater, test–retest, and internal reliability and concurrent validity with the TAS-20. The hierarchic factor structure is made up of four subscales grouped into two higher order factors: conscious emotional awareness (subscale 1 and 2) and operational thinking (subscale 3 and 4). Patients were asked to fill out the TAS-20 questionnaire and undergo the TSIA structured interview. Parents were asked to do the same. The setting remained the same for each patient and parent, each examined separately. The answers to the TSIA were collected by two specifically trained interviewers, both unaware of the scores obtained in the TAS-20 questionnaire. Interviews were then scored by two judges, one being an expert in using the instrument. In rare cases of disagreement in attributing the score, an agreement score was reached. The study relied on the use of Rasch analysis.44 The Andrich Rating Scale Model45 was applied to estimate the measurements obtained from Likert type ratings provided by participants for each of the two scale items. The WINSTEP Ministep Rasch–Model program46 was used to estimate the level of alexithymia expressed by each person on the rating scale. Since the study’s main aim is to compare the item responses47–51 provided by participants, Rasch analysis was applied to the data because of its psychometric features, in particular the invariance of comparisons property. As is generally known, when data fit the Rasch model properly and when comparing the responses of two people, such comparison is independent from stimuli or items that determine the responses. Rasch analysis was applied separately for the two scale total scores and for each of the common factors of the scales (factor 1, DIF; factor 2, DDF; factor 3, EOT). Furthermore, to compare the total scores and scale factors between the two scales, the estimates of each person were standardized. Subsequently, an alexithymia mean standard score was calculated for each family nucleus. To evaluate the difference between alexithymic levels of family members, a contrast standard value was calculated for each couple in the family, more specifically daughter versus mother, daughter versus father, and mother versus father. To summarize the data related to the 16 families, three categories, representing different levels of alexithymia, were created for the families and separately for daughters, mothers, and fathers: category 1 (low) included standard scores below −1.64 (P<0.05), thus respondents with low alexithymia levels; category 2 (middle) ranges between −1.64 and 1.64, thus with middle alexithymia levels; and category 3 (high) above 1.64 (P<0.05), thus high alexithymia levels. Considering the contrasts between family members, the same categories were constructed. Denominating A and B the members of a couple, category 1 (low) included couples with statistically different levels of alexithymia, where A is less alexithymic than B (below −1.64, P<0.05); category 2 (middle) included couples with statistically nonsignificantly different levels of alexithymia (between −1.64 and 1.64, P>0.05); and category 3 (high) contained couples with statistically different levels of alexithymia, where A is more alexithymic than B (above 1.64, P<0.05). Due to the low number of respondents, the frequencies in the categories were converted into percentages.52 The estimated standard scores were categorized instead of calculating mean scores, based on the hypothesis that a comparison between the two scales at low and high levels of distributions should be particularly suited for the purpose of this study. A series of chi-square analyses were elaborated to analyze the differential functioning between the two scales in detecting alexithymia in families, family members, and couple contrasts. Chi-square analyses were performed separately for the common factors and the two scale total scores and for the two extreme categories, low and high. The two extreme categories were considered and the middle one was excluded to highlight statistically significant results. The alexithymia Rasch estimate standard score for each family member, the family mean standard score, the alexithymia contrast standard score between family members in relation to the TSIA and the TAS-20 total scores, and their common factors are presented in Table 2. The data were obtained for each of the 16 families that participated in the study. For illustrative purposes, only the data related to a single family are introduced herein. Notes: Data relative to one of the 16 families. *P<0.05, **P<0.01, ***P<0.001. Abbreviations: TSIA, Toronto Structured Interview for Alexithymia; TAS-20, Toronto Alexithymia Scale; F1, difficulty identifying feelings; F2, difficulty describing feelings; F3, externally oriented thinking; D, daughter; M, mother; F, father. In the selected family, the TSIA detects significantly high alexithymic scores at the total score level for both daughter and father, whereas the mother does not show a significant score. The daughter shows a significantly high score, in particular in relation to factor 1, whereas the mother shows a significantly low level of alexithymia. Concerning factor 2, mother and father have significantly high levels of alexithymia, whereas in factor 3 only the father has a significantly high score. The TAS-20 provides a very different functioning both at the individual and at the family levels. All members of the family, as regards the total score and, in particular, factors 1 and 2, show significantly low levels of alexithymia. Only for factor 3, although the alexithymia is low, is the result not significant. It is worth noting that even the distance between levels of alexithymia of family members differs based on the two scales. Considering the TSIA, the daughter proves to have notably greater difficulties in identifying feelings (factor 1) compared with the mother or the father. This is not the case in the TAS-20, where all the family members scored similarly low. The TSIA factor 2 instead shows that the daughter is better able to describe her own feelings compared with her father. The opposite occurs with the TAS-20, where the father considers himself less alexithymic than his daughter. As stated, to summarize the data of the 16 families, three categories representing different levels of alexithymia were created for the families and separately for daughters, mothers, and fathers. Furthermore, to evaluate the contrasts between alexithymic levels of couples in the family, the same categories were constructed for daughter versus mother, daughter versus father, and mother versus father. The results are illustrated graphically, where the two scales are compared in relation to the three common factors and total score. In Figure 1, the distribution of frequency percentages is associated with the low and high categories for family alexithymia mean standard score; similarly, in Figure 2, the distribution of frequency percentages with the family members; and, in Figure 3, the distribution of frequency percentages relates to the contrasts between family members for the categories low and high. Successively, chi-square analyses were performed to test the statistical significance of the differential functioning between the two scales in relation to the factors and to the total scores. 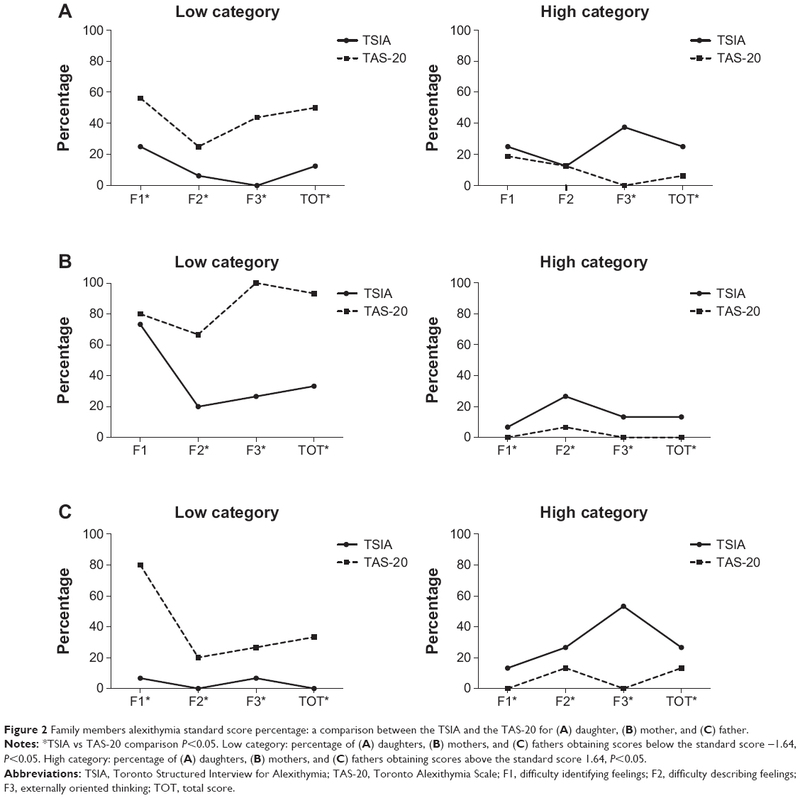 Figure 1 Family alexithymia mean standard score percentage: a comparison between the TSIA and the TAS-20. Notes: *TSIA vs TAS-20 comparison P<0.05. Low category: percentage of family obtaining scores below the standard score −1.64, P<0.05. High category: percentage of family obtaining scores above the standard score 1.64, P<0.05. Abbreviations: TSIA, Toronto Structured Interview for Alexithymia; TAS-20, Toronto Alexithymia Scale; F1, difficulty identifying feelings; F2, difficulty describing feelings; F3, externally oriented thinking; TOT, total score. Figure 2 Family members alexithymia standard score percentage: a comparison between the TSIA and the TAS-20 for (A) daughter, (B) mother, and (C) father. Notes: *TSIA vs TAS-20 comparison P<0.05. Low category: percentage of (A) daughters, (B) mothers, and (C) fathers obtaining scores below the standard score −1.64, P<0.05. High category: percentage of (A) daughters, (B) mothers, and (C) fathers obtaining scores above the standard score 1.64, P<0.05. Figure 3 Family couple contrasts alexithymia standard score percentage: a comparison between the TSIA and the TAS-20 for (A) daughter (D) versus mother (M), (B) daughter (D) versus father (F), and (C) mother (M) versus father (F). Notes: *TSIA vs TAS-20 comparison P<0.05. Low category: percentage of contrasts (A) daughter versus mother, (B) daughter versus father, and (C) mother versus father below the standard score –1.64, P<0.05. High category: percentage of contrasts (A) daughter versus mother, (B) daughter versus father, and (C) mother versus father above the standard score 1.64, P<0.05. 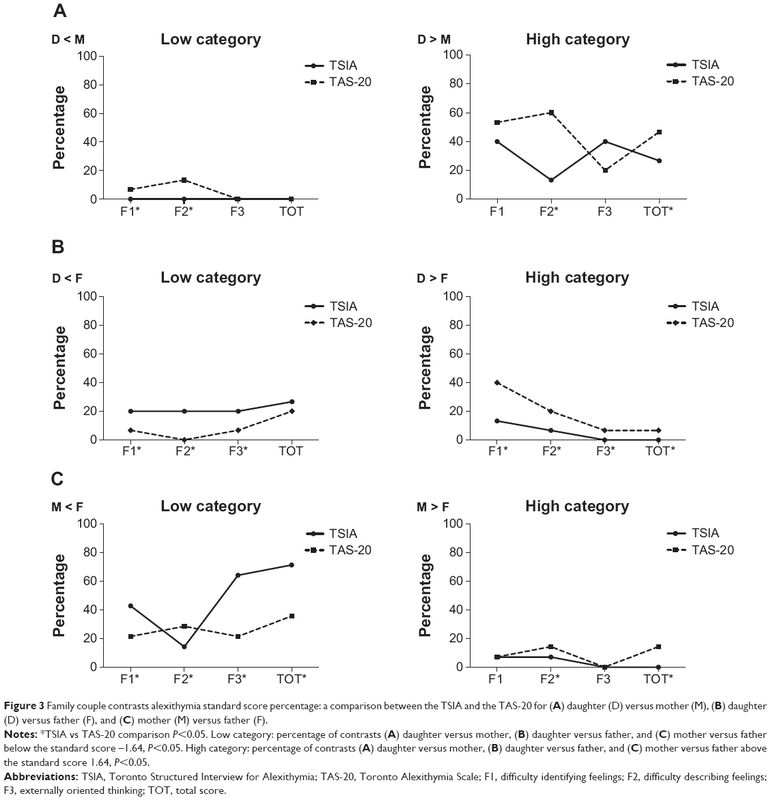 The data related to the 16 families in Figure 1 indicate that, for all the factors and for the total score, the TAS-20 is characterized by a significantly (P<0.001) larger number of cases (range 18.5%–75%) than the TSIA (range 0.0%–2.5%) associated with the low category, which contains the families with average low levels of alexithymia, whereas the TSIA is specified by a significantly (P<0.001) higher number of cases (range 6.25%–25%) (except for factor 1) associated with the high category, which includes the families with average high levels of alexithymia. Particularly evident is the differential function of the two scales in relation to factor 1 and to the total score at the low category level and to factor 3 at the high category level. The data from our sample in Figure 2 indicate that, for each family member, for all factors and total scores, the TAS-20 shows a significantly (P<0.001) larger number of cases (range 20%–100%) than the TSIA (0.0%–3.3%) associated with the low category, whereas the TSIA in general shows a significantly (P<0.001) higher number of cases (6.7%–53.3%) than the TAS-20 (range 0.0%–8.75%) associated with the high category. Considering the low category, a particularly salient difference is between the two scales with regard to factor 1, factor 3, and the total score for the daughter, factor 3 and the total score for the mother, and factor 1 for the father. In the high category, the two scales show different functioning, especially in relation to factor 3 for the daughter, factor 2 for the mother, and factor 3 for the father. In Figure 3, the distribution of frequency percentages is concerned with the contrasts between members in the family for the low and high categories. The low category contains the cases where the first member in the couple has a significantly lower level of alexithymia than the second member in the couple. On the contrary, the high category includes the cases where the first member in the couple has a significantly higher level of alexithymia than the second one. Once again, the TSIA scale can serve to better illustrate the relations among and between family members compared with the TAS-20, both at the low and the high level. The prime aim of this study is to examine how the two measuring instruments, the self-report and the clinical interview, developed by the Toronto-based group differ in their ability to detect the presence and intensity of alexithymia within the anorexic patients’ families. Despite its widespread use and unquestionably easy application in research domains, the TAS-20 questionnaire has nonetheless revealed some important limits in terms of accuracy and clinical validity, especially when examining psychopathological conditions.27,53 Families with anorexic adolescents can prove to be a particularly difficult context that calls for more in-depth clinical evaluation of alexithymia rather than the faster, more economical self-report evaluation. Differently from other studies in literature, latent trait analysis adopted in this research allowed us to examine each subject’s alexithymia at a latent level, independently from the content of the items and from other intervening variables, due to the administering set.54 Latent trait analysis therefore allows the patients’ and parents’ alexithymic levels to be compared as detected by the two instruments. Significant discordance was found between the two measures, both in the total as well as in the components of alexithymia, common to both scales (F1-DIF, F2-DDF, F3-EOT). The clinical instrument detected a greater level of alexithymia compared with the self-report. In particular, in our adult parent sample, alexithymia was higher when based on the structured interview administered by clinicians rather than on the answers the subjects provided themselves, the sole exception being the first factor for the mothers. In such case, the lower scores detected by the two instruments were not significantly different, because mothers generally tend to be aware of their own ability to identify feelings (F1), which is correctly reported in the self-administered test too. The study results on the overall level of family alexithymia are worthy of notice. Compared with the TAS-20, the TSIA interview has identified a much higher level of family alexithymia for all of the factors. In the total score, the mean family alexithymia index was very high in some families (13%) only when using the TSIA measurement, while no families had low alexithymic scores. Paradoxically, the contrary occurs when using TAS-20. No family had high alexithymic scores, with as much as 75% of the families scoring very low, based on the answers provided by the subjects. Considering the role of paternal rather than maternal alexithymia is somewhat innovative, compared with the approaches in current studies on adult patients and their parents.4,5 Conceivably, this particular way of functioning of fathers may, in part, be a previous salient characteristic of their personality. Within the couple, concrete thinking and cutting off emotions could lead these men to have a collusive relationship with more emotional reactive women. The complex dynamics created in this kind of couple may subsequently include young anorexic daughters. Nonetheless, a pivotal point to bear in mind is that the adolescent daughter’s life-threatening condition of being is a traumatic factor that often leads such men, who may perhaps already be inclined, to adopt massive defense mechanisms and to freeze their emotions.5 This type of paternal response to the daughter’s pathology can, in turn, negatively affect the evolution, triggering a vicious circle. Currently, plenty of documented proof illustrates how a lack of communication and emotional communication perceived by the patients in the families,6,9,56 and a greater extent of coldness and hostility,7,9 even on the father’s part,7,57 can play a negative role in eating disorders. Family relationships are well worth investigating from such a perspective. In the case of alexithymia, the differences in emotional functioning among the various family members were analyzed. The focus was placed primarily on examining how various couples, mother–daughter, father–daughter, and mother–father, differ in terms of alexithymia. Even at this level the TSIA and the TAS-20 differ, especially when considering, within the couples, the father’s alexithymia, which turns out to be lower in the self-report and higher in the interview. In considering total alexithymia, the comparison involving the mother and father parental couple is the most striking. Mothers tend to be less alexithymic than fathers. This difference is even more striking from the use of the clinical interview, which minimizes the paternal negation tendency. Total alexithymia, when measured with the TSIA, revealed a wide gap between the two partners in as much as 71% of the couples, with husbands being more alexithymic than wives. The level of alexithymia between the two partners is therefore comparable only in a very limited number of couples where there is a sort of alexithymic accordance, whereas the opposite case, that of a more alexithymic wife, was not detected in any couple. Many daughters also have a lower level of alexithymia compared with their father’s when measured with the TSIA clinical interview. The exact contrary is true with the TAS-20 self-report, as fathers are more inclined toward negation, whereas, in both self-report and interview, most cases resulted in more alexithymic daughters compared with their mother, whose alexithymia is generally not high. One of the major innovations in our study is the use of the TSIA. To date, no other study has explored the alexithymia of adolescent anorexic patients and their parents using self-report in tandem with a clinical interview. Results suggest that a clinical interview may be a more sensitive instrument in detecting alexithymia. Compared with the TAS-20, the clinical interview may detect different, and perhaps finer, elements and thus be better at capturing the gap among the different family members’ alexithymia. This would justify carrying out the validation process of the TSIA for the Italian adolescent population. Aside from the aforementioned lack of validation for Italian adolescents, the study’s other weaknesses include not having a control group and requiring an expanded adolescent–parent sample. It is important to note that the Rasch modeling approach applied in this study, due to the model’s property invariance of comparisons, should substantially overcome the limitation of lacking a comparator group.54 Future research should thus be extended to include other families within the sample and, whenever possible, the patient’s siblings within each family. Presently, this was not possible due to ethical problems and to the family’s reluctance to adhere. Future studies could also integrate an evaluation of other psychological aspects (ie, attachment,51 depression19,20) studied not only at the individual level but also within the family system. It may also be interesting to include some outcome measures on adolescent anorexia. The value and the relevance of the alexithymic index at the family level could thus be assessed. In the future, the authors expect to carry out a prolonged observation of the patients’ evolution to gain better understanding of whether the variables studied are prognostically significant. Results seem to indicate that the clinical interview may be a more sensitive instrument compared with the self-report, allowing data integration on the functioning of adolescent anorexic patients and their parents. The TSIA interview can therefore be an instrument worth validating for the adolescent age group. Moreover, the study of a couple’s functioning in terms of alexithymia has spotlighted a significant alexithymic gap within families, particularly within parental couples, where fathers are noticeably more alexithymic than mothers. Clinical questions have arisen on how useful it may be to give greater weight to family functioning rather than to individual personality traits in predicting the possibility of establishing a therapeutic alliance and thus the outcome of the anorexic adolescent. The authors warmly thank all of the adolescents and parents who took part in the study, along with all those who have supported us with their precious help. Godart N, Berthoz S, Curt F, et al. A randomized controlled trial of adjunctive family therapy and treatment as usual following inpatient treatment for anorexia nervosa adolescents. PLoS One. 2012;7(1):e28249. Lumley MA, Mader C, Gramzow J, Papineau K. Family factors related to alexithymia characteristics. Psychosom Med. 1996;58(3):211–216. Dahlman K. Affective capacity in mothers of eating disorders patients. Diss Abstr Int B Sci Eng. 1996;56(9):5163–5164. Guttman H, Laporte L. Alexithymia, empathy, and psychological symptoms in a family context. Compr Psychiatry. 2002;43(6):448–455. Espina A. Alexithymia in parents of daughters with eating disorders: its relationships with psychopathological and personality variables. J Psychosom Res. 2003;55(6):553–560. Rodríguez Martín A, Novalbos Ruiz JP, Martínez Nieto JM, Escobar Jiménez L, Castro De Haro AL. Epidemiological study of the influence of family and socioeconomic status in disorders of eating behaviour. Eur J Clin Nutr. 2004;58(6):846–852. Ravi S, Forsberg S, Fitzpatrick K, Lock J. Is there a relationship between parental self-reported psychopathology and symptom severity in adolescents with anorexia nervosa? Eat Disord. 2009;17(1):63–71. Lyke J, Matsen J. Family functioning and risk factors for disordered eating. Eat Behav. 2013;14(4):497–499. Duclos J, Dorard G, Berthoz S, et al. Expressed emotion in anorexia nervosa: what is inside the “black box”? Compr Psychiatry. 2014;55(1):71–79. Taylor GJ, Parker JD, Bagby RM, Bourke MP. Relationships between alexithymia and psychological characteristics associated with eating disorders. J Psychosom Res. 1996;41(6):561–568. Harrison A, Sullivan S, Tchanturia K, Treasure J. Emotion recognition and regulation in anorexia nervosa. Clin Psychol Psychother. 2009;16(4):348–356. Bomba M, Corbetta F, Gambera A, et al. Heart rate variability in adolescents with functional hypothalamic amenorrhea and anorexia nervosa. Psychiatry Res. 2014;215(2):406–409. Conti E, Tremolizzo L, Bomba M, et al. Reduced fasting plasma levels of diazepam-binding inhibitor in adolescents with anorexia nervosa. Int J Eat Disord. 2013;46(6):626–629. Speranza M, Loas G, Wallier J, Corcos M. Predictive value of alexithymia in patients with eating disorders: a 3-year prospective study. J Psychosom Res. 2007;63(4):365–371. Zonnevijlle-Bender MJ, van Goozen SH, Cohen-Kettenis PT, van Elburg A, van Engeland H. Do adolescent anorexia nervosa patients have deficits in emotional functioning? Eur Child Adolesc Psychiatry. 2002;11(1):38–42. Zonnevylle-Bender MJ, van Goozen SH, Cohen-Kettenis PT, van Elburg TA, van Engeland H. Emotional functioning in adolescent anorexia nervosa patients – a controlled study. Eur Child Adolesc Psychiatry. 2004;13(1):28–34. Zonnevylle-Bender MJ, van Goozen SH, Cohen-Kettenis PT, et al. Emotional functioning in anorexia nervosa patients: adolescents compared to adults. Depress Anxiety. 2004;19(1):35–42. Lulé D, Schulze UM, Bauer K, et al. Anorexia nervosa and its relation to depression, anxiety, alexithymia and emotional processing deficits. Eat Weight Disord. 2014;19(2):209–216. Bomba M, Corbetta F, Bonini L, et al. Psychopathological traits of adolescents with functional hypothalamic amenorrhea: a comparison with anorexia nervosa. Eat Weight Disord. 2014;19(1):41–48. Corcos M, Guilbaud O, Speranza M, et al. Alexithymia and depression in eating disorders. Psychiatry Res. 2000;93(3):263–266. Speranza M, Stéphan P, Corcos M, et al. [Relationships between alexithymia, depression and interpersonal dependency in addictive subjects]. Ann Med Interne (Paris). 2003;154(Spec No. 1):S65–S75. French. Speranza M, Corcos M, Loas G, et al. Depressive personality dimensions and alexithymia in eating disorders. Psychiatry Res. 2005;135(2):153–163. Montebarocci O, Codispoti M, Surcinelli P, Franzoni E, Baldaro B, Rossi N. Alexithymia in female patients with eating disorders. Eat Weight Disord. 2006;11(1):14–21. Parling T, Mortazavi M, Ghaderi A. Alexithymia and emotional awareness in anorexia nervosa: time for a shift in the measurement of the concept? Eat Behav. 2010;11(4):205–210. Rozenstein MH, Latzer Y, Stein D, Eviatar Z. Perception of emotion and bilateral advantage in women with eating disorders, their healthy sisters, and nonrelated healthy controls. J Affect Disord. 2011;134(1–3):386–395. Lumley MA. Alexithymia and negative emotional conditions. J Psychosom Res. 2000;49(1):51–54. Lumley MA, Neely LC, Burger AJ. The assessment of alexithymia in medical settings: implications for understanding and treating health problems. J Pers Assess. 2007;89(3):230–246. Caretti V, La Barbera D, eds. Alessitimia. Valutazione e trattamento. Rome, Italy: Astrolabio; 2005. Taylor GJ, Bagby RM. New trends in alexithymia research. Psychother Psychosom. 2004;73(2):68–77. Guilbaud O, Berthoz S, Dupont ME, Corcos M. Alexithymie et troubles psychosomatiques. [Alexithymia and psychosomatic disorders]. Psychiatrie. 2009;37–400-D–20. French. Berthoz S, Perdereau F, Godart N, Corcos M, Haviland MG. Observer- and self-rated alexithymia in eating disorder patients: levels and correspondence among three measures. J Psychosom Res. 2007;62(3):341–347. Haviland MG, Warren WL, Riggs ML. An observer scale to measure alexithymia. Psychosomatics. 2000;41:385–392. Bagby RM, Parker JD, Taylor GJ. The twenty-item Toronto Alexithymia Scale-I. Item selection and cross-validation of the factor structure. J Psychosom Res. 1994;38(1):23–32. Bagby RM, Taylor GJ, Parker JD. The Twenty-item Toronto Alexithymia Scale-II. Convergent, discriminant, and concurrent validity. J Psychosom Res. 1994;38(1):33–40. Bagby RM, Taylor GJ, Parker JD, Dickens SE. The development of the Toronto Structured Interview for Alexithymia: item selection, factor structure, reliability and concurrent validity. Psychother Psychosom. 2006;75(1):25–39. Tremolizzo L, Conti E, Bomba M, et al. Decreased whole-blood global DNA methylation is related to serum hormones in anorexia nervosa adolescents. World J Biol Psychiatry. 2014;15(4):327–333. Bomba M, Riva A, Veggo F, et al. Impact of speed and magnitude of weight loss on the development of brain trophic changes in adolescents with anorexia nervosa: a case control study. Ital J Pediatr. 2013;39:14. Bressi C, Taylor G, Parker J, et al. Cross validation of the factor structure of the 20-item Toronto Alexithymia Scale: an Italian multicenter study. J Psychosom Res. 1996;41(6):551–559. Taylor GJ, Bagby RM. Measurement of alexithymia. Recommendations for clinical practice and future research. Psychiatr Clin North Am. 1988;11(3):351–366. Caretti V, Porcelli P, Solano L, Schimmenti A, Bagby RM, Taylor GJ. Reliability and validity of the Toronto Structured Interview for Alexithymia in a mixed clinical and nonclinical sample from Italy. Psychiatry Res. 2011;187(3):432–436. Garner DM. EDI-3 Eating Disorder Inventory-3. Adattamento Italiano. Florence, Italy: Giunti Organizzazioni Speciali; 2008. Kaufman J, Birmaher B, Brent DA, Ryan ND, Rao U. K-SADS-PL. J Am Acad Child Adolesc Psychiatry. 2000;39(10):1208. Rasch G. Probabilistic Models for Some Intelligence and Attainment Tests. Chicago, IL: The University of Chicago Press; 1960. Andrich DA. Rating formulation for ordered response categories. Psychometrika. 1978;43:561–573. Linacre JM. A user’s guide to WINSTEPS MINISTEP Rasch-Model computer programs (version 3.81.0.0) [webpage on the Internet]. Available from: http://www.winsteps.com. Accessed September 2, 2014. Mannarini S. A method for the definition of a self-awareness dimension with clinical subjects: a latent trait analysis. Behav Res Methods. 2009;41(4):1029–1037. Mannarini S. Assessing the Rosenberg Self-Esteem Scale dimensionality and items functioning in relation to self-efficacy and attachment styles. TPM Test Psychom Methodol Appl Psychol. 2010;17(4):229–242. Mannarini S, Polimeni S, Shams M, Giacobbo M. Assessing negative and positive mood states: the identification of a short form of the POMS scale in Italian oncology outpatients. TPM Test Psychom Methodol Appl Psychol. 2012;19(2):135–145. Mannarini S, Boffo M, Bertucci V, Andrisani A, Ambrosini GA. Rasch-based dimension of delivery experience: spontaneous vs medically assisted conception. J Clin Nurs. 2013;22(17–18):2404–2416. Mannarini S, Boffo M. The relevance of security: a latent domain of attachment relationships. Scand J Psychol. 2014;55:53–59. Koehler KJ, Larntz K. An empirical investigation of goodness-of-fit statistics for sparse multinomials. J Am Stat Assoc. 1980;75:336–344. Leising D, Grande T, Faber R. The Toronto Alexithymia Scale (TAS-20): a measure of general psychological distress. J Res Pers. 2009;43(4):707–710. Cristante F, Mannarini S. Misurare in Psicologia. Il Modello di Rasch. Bari, Italy: Laterza; 2004. Corbetta F, Bomba M, Tremolizzo L, Neri F, Nacinovich R. The use of the Psychodynamic Diagnostic Manual (PDM) in child and adolescent psychiatry: application in a sample of adolescents affected by anorexia nervosa. Giornale di Neuropsichiatria dell’Età Evolutiva. 2014;34:29–38. Rommel D, Nandrino JL, Antoine P, Dodin V. Emotional differentiation and parental bonding in inpatients suffering from eating disorders. Br J Clin Psychol. 2013;52(2):215–229. Le Grange D, Lock J, Loeb K, Nicholls D. Academy for eating disorders position paper: the role of the family in eating disorders. Int J Eat Disord. 2010;43(1):1–5. Inslegers R, Vanheule S, Meganck R, Debaere V, Trenson E, Desmet M. Interpersonal problems and cognitive characteristics of interpersonal representations in alexithymia: a study using a self-report and interview-based measure of alexithymia. J Nerv Ment Dis. 2012;200(7):607–613. Fornari V, Wlodarczyk-Bisaga K, Matthews M, Sandberg D, Mandel FS, Katz JL. Perception of family functioning and depressive symptomatology in individuals with anorexia nervosa or bulimia nervosa. Compr Psychiatry. 1999;40(6):434–441.